Still here! The wind was quite alarming through yesterday afternoon and evening. You wouldn’t survive for long outside. 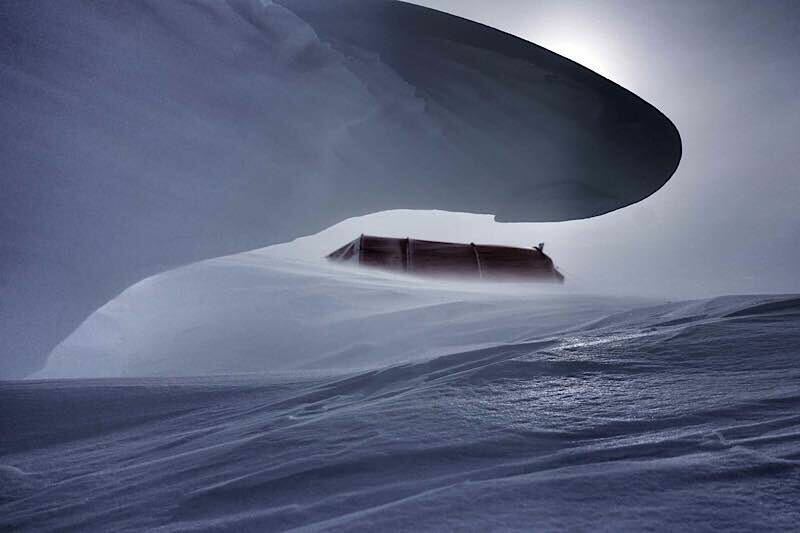 But inside this sturdy little tent we are safe and warm. It’s a Hilleberg Keron GT4. A tunnel tent- quick to pitch, roomy for 2, a bit of a squeeze for 3. It didn’t flinch in the 40 knot winds we had last night and seems to be the weapon of choice for most other expeditions out here as well. 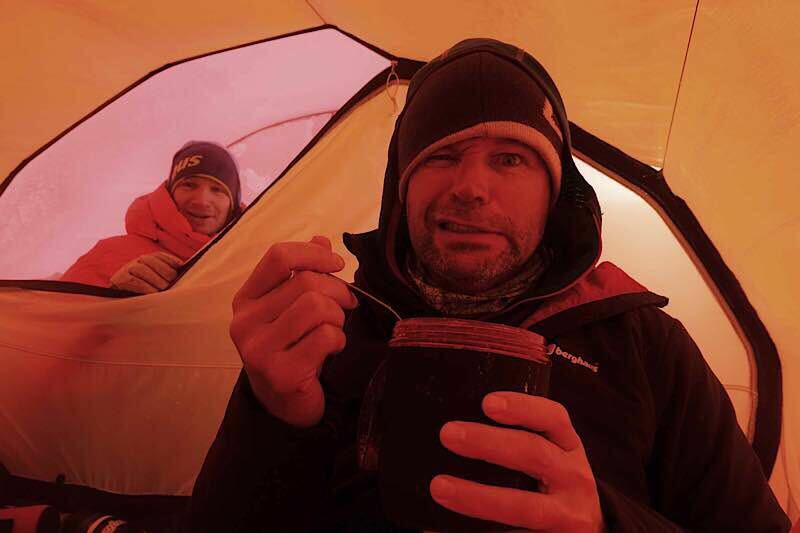 Hilleberg Keron 4GT – Keeping us safe and warm. Whilst on the subject of gear we’re cooking on an MSR Whisperlite stove. We have 4 of them and 10 pumps, as without a stove we would have no water and hence no food. Although the stoves are great, they do create lots of steam which coats everything in frost. We are currently exiting the tent into the large porch to cook with the internal door closed, but that requires donning full outside gear. It is possible to cook in the porch sitting inside or even to cook inside the tent, but for now we are keeping it outside. Jean just handed me a cup of hot coffee. Mark is attempting to brush off the frozen rime from inside the tent whilst it immediately reforms from the steam for our drinks. We just slept for 12 hours! Surprisingly warm inside layers of down and fleece. Too warm in fact, I had to strip off a layer early this morning. The wind has abated a lot, but the visibility is still very bad so doesn’t look like we’ll be moving today. I reviewed some of the footage we shot outside during the storm and am cursing that I didn’t shoot more. 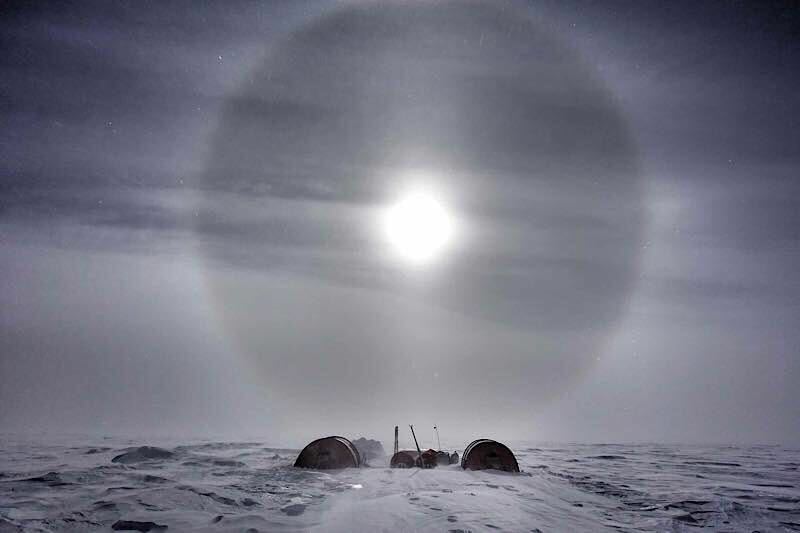 It looks exactly as you’d imagine a South Pole blizzard would! Very impactful! But it was brutal outside! 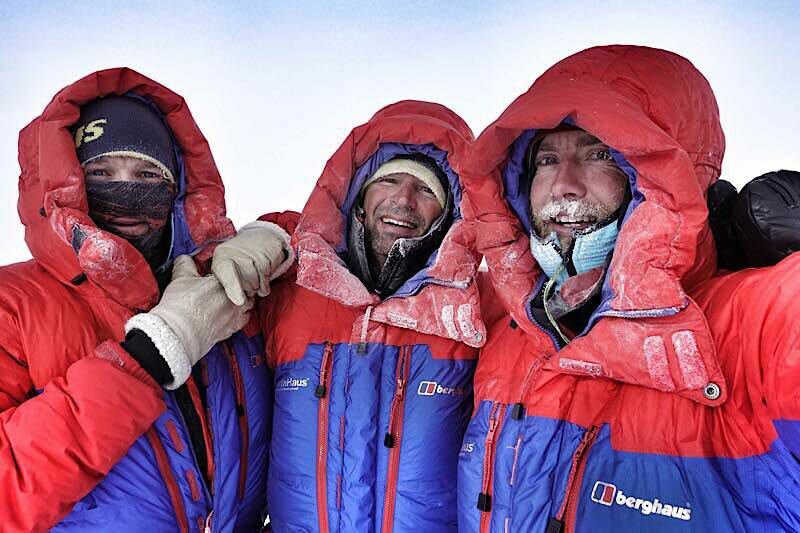 Our Berghaus down suits are awesome outside in the savage cold. Really make you feel invulnerable. My main concerns when we come to kite are glove and face systems. It’s really hard to make any adjustments once you’ve launched the kite and started moving, meaning a simple glove change or balaclava adjustment could require the whole team stopping and losing valuable kms. Weather is due to improve over next day or two. I’m praying for some stable high pressure and 10-12 knot wind for our first session. Kind conditions to ease us in. I fear we may have to start out in sub-optimal conditions, stronger winds and poorer visibility, which is OK but reduces the margins a little bit. Everybody is in good spirits despite our false start, but we are raring to go! Realistically it will be the day after tomorrow. Now it’s getting cold. Time to get back in the sleeping bag and savour simple warmth. Thanks for the insight into the kit, geeky I know, but I love it. Will be following you all the way boys! Godspeed.